Iran's Islamic Revolutionary Guards Corps (IRGC) Quds force commander Gen. Qassem Soleimani has for two years maintained an Instagram account, and despite the well-known elite Iranian force commander being formally designated a terrorist by the U.S. Department of the Treasury since 2011, the account hasn't been suspended. 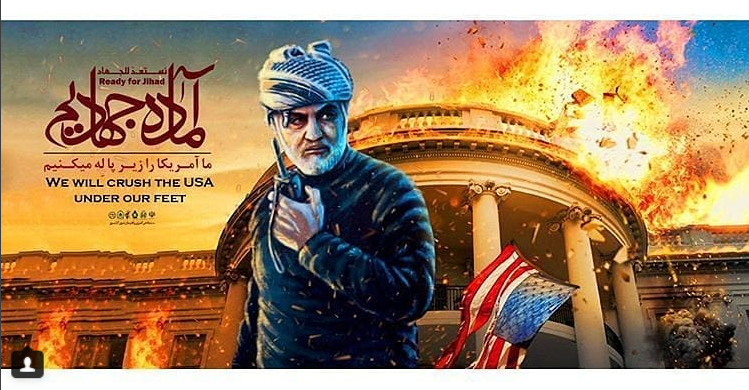 Among a number of prior threatening images, Gen. Soleimani recently posted an artistic rendering of himself standing in front the White House, which is depicted as on fire after an explosion. Soleimani's account has been authenticated as his own by the Middle East Media Research Institute's (MEMRI) Cyber and Jihad Lab in a new report. 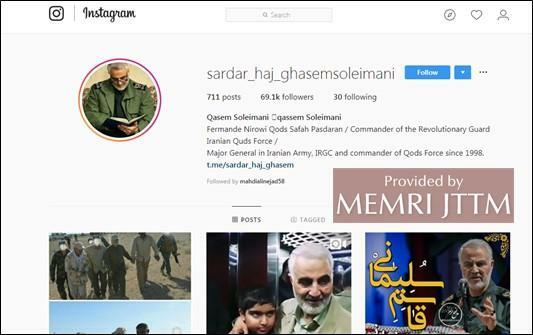 The above image post appeared on the following account authenticated as Gen. Soleimani’s by MEMRI: His Instagram handle is @sardar_haj_ghasemsoleimani; he first posted on July 28, 2016. At the time of this writing, he had 710 posts and 69,100 followers, and is following 30 accounts. 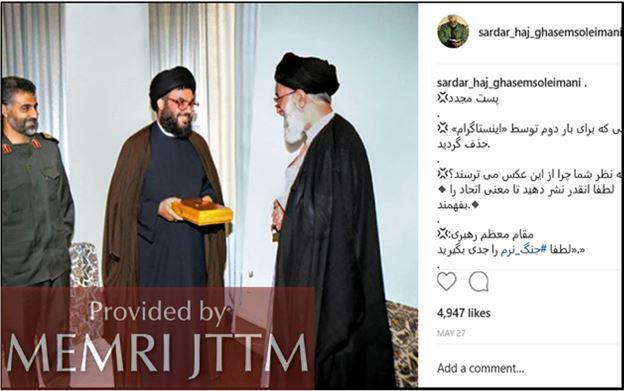 His account bio reads “Major General in Iranian Army, IRGC and commander of Qods Force since 1998,” and links to his Telegram account, T.me/sardar_haj_ghasem. Since MEMRI's analysis was published Thursday, Soleimani's account has grown to over 70,000 followers and continues to be very active with a dozen more updates since the report was issued. Notably the post, which includes both English and Farsi words that read, "Ready for Jihad - We will crush the USA under our feet," was published on July 28 — at the end of the same week that included threats and counter threats exchanged between President Trump and Iranian President Hassan Rohani. Trump had started that week responding to Rouhani's warnings for the US not to provoke Iran or halt Iranian oil exports. Know that we are near you, in places that don’t come to your mind. We are near you in places that you can’t even imagine. We are a nation of martyrdom… You know that a war would mean the loss of all your capabilities. You may start the war, but we will be the ones to determine its end. And further some feature Iranian leaders greeting Hezbollah Secretary-General Hassan Nasrallah, such as the below photo which shows Iran's Supreme Leader Ali Khamenei and Nasrallah in an official visit. This begs the obvious question: does posting an image of the White House being blown up not constitute a clear violation of Instagram's conditions? If it doesn't, then we don't know what does. Others recognizable political figures have been kicked off for much less.